HIT THE HOT SPOT. CHILL. Unwind. Chill out. Then watch the night warm up at Tease, the trendy nightspot with plush sofas and ottoman seating at Vivanta by Taj - Begumpet, Hyderabad. The drinks flow easy. The Pan Asian wokery works up generous helpings, supported by Indian and Continental delights. Tease has originals that are the most sought after. And the barman is not telling what makes the cocktails here out of this world. The result of many a mix has resulted in wow combinations. See fresh fruit and herbs happily muddled to make refreshing cocktails. From classic Martinis to signature favourites. From infused vodkas to a choice of international beers, malts and rare scotch whisky. 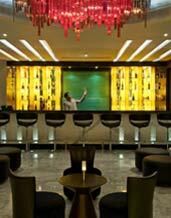 Mood lighting and stylish service enhance the experience while the DJ pumps up the beat. It's all happening here.